This lightweight Honda HHH25D Hedgecutter with economic design and effortless power from its 25cc, mini 4-stroke engine. Starts first time, every time wih Honda's famous one pull easy start system. Envioronmentally friendly with low emissions, low noise and low fuel consumption. No fuel mixing-runs on unleaded petrol and a lightweight design. 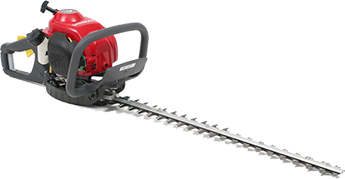 PLEASE NOTE: This Hedge Trimmer is currently out of stock. Stock will be available from mid-July.